"We had a great time! The actors were awesome! Can't wait to come again." "What a fun entertaining place to be! ! The actors and actresses were AMAZING, food was delicious, and great for all ages! ! We will definitely refer our friends and family to go! ! Thank you for making our night memorable! !" "We had THE BEST TIME! My husband surprised me with the Gourmet Detective as part of our 30th Anniversary weekend and it was one of the best things we could have done together. We laughed and ate and laughed and ate and laughed some more - so much fun! Loved the way the cast interacted with the audience and seemd to genuiney care that everyone had a good time. The food was wonderful too." 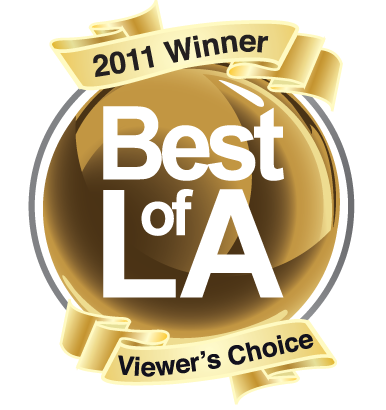 "2015 Best of LA Best Dinner Theaters"
"The Best-In-Region 2010 Talk of the Town Award for Excellence in Customer Satisfaction"
Critic's Choice Award for "Best Dinner Theater"
"2010 Best Dinner Theater in Southern California"